“We proclaim to you what we have seen and heard, so that you also may have fellowship with us. And our fellowship is with the Father and with his Son, Jesus Christ." As a man who has spent most of his life around ultra-conservative Christians, occasionally even Pharisaical legalists, the word fellowship prompts thoughts of division. Terms like "disfellowship" and "lines of fellowship" are common subjects. Fellowship is often seen more as a distinguishing mark of separation than it is a Divine invitation. In 1 John 1:3, the apostle John does something marvelous with the word "fellowship". In fact, he spends much of the book developing this same point. Fellowship, says John, is not based upon human boundaries or self-righteous doctrines. Fellowship is based upon a discovery and submission to God. It was never intended to be a wall behind which God's people should retreat. It is a door through which God's people make an invitation. Notice again John's words, "We proclaim to you what we have seen and heard, so that you also may have fellowship with us." A second thing we should notice about the word "fellowship" is where the fellowship originates, "…our fellowship is with the Father and with his Son, Jesus Christ." Our spiritual bond must include both the "Father" and the "Son" in order for it to be the same fellowship experienced between the apostles and the tangible God/man, Jesus. Last night after mid-week services, we dropped Cindy and Gabriel off at the house and Bryson and I made a run to Walmart. While bouncing around the food section, we bumped into two of Bryson's friends. I was immediately drawn into the conversation. Bryson gives me connection. Because we are close, his friends become my friends and my friends are his. In 1 John 1:3, the Holy Spirit says that fellowship with the Father equals fellowship with the Son. In addition, fellowship with the Father and Son results in fellowship with the early apostles who actually had the privilege of hearing, seeing, and touching the very God/man Himself. Wow! That is a fellowship worth sharing! Let's stop erecting human barriers that keep people out and start issuing the Divine invitation that draws people in. For assurance to be sure, we must let God speak for Himself. We must be true to the inspired context. After each study, read the entire chapter again taking note to the way today's verse relates to all the verses around it. Due to the colorful, complex nature of the original language, the best translation is multiple translations. Following each lesson, this chapter will be presented in a different translation. Below, we have featured the New King James Version. That which was from the beginning, which we have heard, which we have seen with our eyes, which we have looked upon, and our hands have handled, concerning the Word of life— the life was manifested, and we have seen, and bear witness, and declare to you that eternal life which was with the Father and was manifested to us— that which we have seen and heard we declare to you, that you also may have fellowship with us; and truly our fellowship is with the Father and with His Son Jesus Christ. And these things we write to you that your joy may be full. "Complete Joy: 1 John 1:4"
"God is Light: 1 John 1:5"
"Fellowship with Light: 1 John 1:6"
"Walk In or Out of the Light: 1 John 1:7"
"Formula for Assurance (Part 1): Honesty 1 John 1:8"
"Formula for Assurance (Part 2): Confession 1 John 1:9"
"Formula for Assurance (Part 3): Application 1 John 1:10"
Missed the first three parts of this study? Check them out! 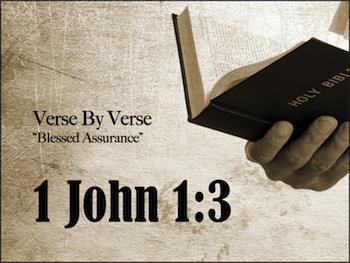 "Blessed Assurance: 1 John 1 Introduction"
"Jesus - Word of Life: 1 John 1:1"
"Jesus - Eternal Life: 1 John 1:2". Back to Top of "Fellowship With the Father and the Son"